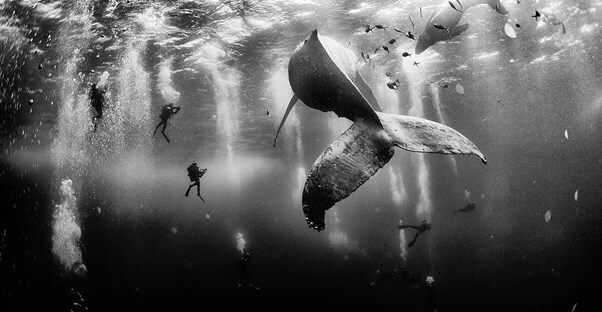 Every year, the National Geographic Society sponsors a photo contest for its National Geographic Traveler magazine. While over 18,000 submissions are received, only 10 images are awarded prizes: first, second, and third places as well as seven merit winners. This year's stunning images capture everything from surreal otherworldly landscapes to deeply intimate moments. As the Grand Prize winner, Floriuk receives an eight-day trip to Costa Rica and the Panama Canal to take part in a National Geographic photo excursion. Not a bad return on the $15 submission fee. He snapped this picture of a humpback whale and its calf off the coast of the Revillagigedo Islands in Mexico. Coming in second with this dramatic portrait of Bengladeshi gravel crushers, Azim won a six-day photo tour of Yellowstone's winter wildlife. The recipient of a six-day cruise, Toqui won third place for his lively image of traditional Omani camel racing. Zardini had to brave the cold in order to snap this picture of a sauna perched on a mountain top in the Italian Alps. Gutescu's picturesque shot of a winter Romanian landscape seems right out of a Grimm brothers fairy tale. McCarley shows her photography skills with this 900-year-old tree in front of the Milky Way at night. Though it was entered into the "Spontaneous Moments" category, this fun photo from Sarah Wouters seems almost perfectly staged. Jurecki channels the famous American Gothic painting by Grant Wood during this moment he captured between two Polish haymakers.